EMC has announced the first offering on its new multi-tenant, public cloud architecture: a service called Supplier Exchange to help customers in the energy and engineering industries manage complex contracts involving multiple suppliers and vast numbers of documents. This report highlights the extended collaboration issues commonly experienced companies in the energy and engineering industries. 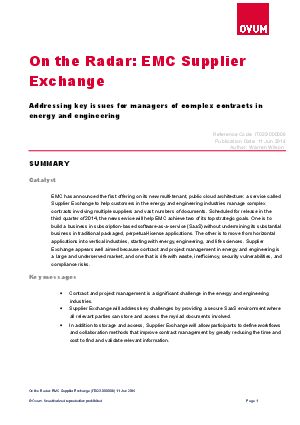 Download this report to find out why does contract management pose such challenges for energy and engineering companies, and how does Supplier Exchange address these challenges.